Royal Holiday Tours is one of the biggest names in Delhi-NCR for quality tempo traveller on rent services at cheapest prices. We have a well-maintained fleet of latest models vehicles such as Toyota Innova, Toyota Crysta, Swift Dzire, Wagon R, Tavera, Mahindra XYLO etc. 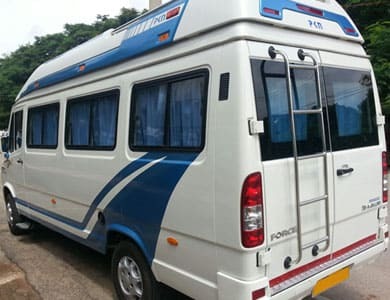 If we talk about big vehicles then we have 9, 10,12,14,16,17,20,22,26 seater tempo travellers and 30, 35, 40, 45, 50 seater Mini Bus on rent for big group tours like students tours, or family tours etc. Our company also provides Volvo bus service from Delhi to Shimla, Manali, Dharamshala, Haridwar, and Rishikesh etc. Our mostly vehicles have luxury modified amenities and high-level security system to ensure you for a comfortable and safest journey on road. Our all four-wheelers are equipped with GPS Tracker, which is very helpful to locate your desired route. Royal Holiday Tours is not an only travel agency but we are your travel partner before, after and during the trip. 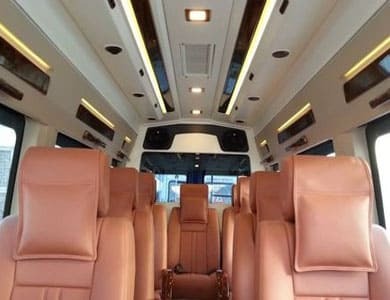 We are a brand in India when you are thinking about to hire luxury tempo traveller in Delhi. 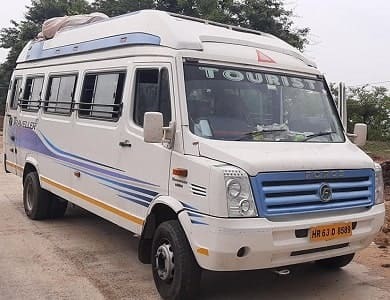 You can book our tourist vehicles online through our official website TempoTravellerinDelhi.in for Personal use, Corporate Use, Local use, and Outstation use. Our professionals are 24/7 available to help you. Whether it is a family trip, couple trip, individual trip, we are always ready with our finest travel arrangements all over India. 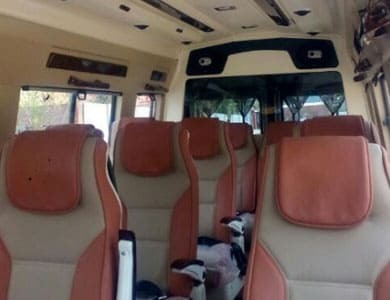 If you love travelling in groups and want a luxurious and delightful road trip then you can hire our 26 Seater tempo traveller. Royal Holiday Tours was started in 2001 at Connaught Place, New Delhi to give tourist best travel services at affordable prices. We are one stop shop in Delhi for 2 stars, 3 star, 4 stars and 5-star hotel booking, Air Tickets booking, Train reservation, and many other travel related services. We also provide outstation destination tours like Shimla, Manali, Kullu, Dharamshala, Dalhousie, Jim Corbett, Dehradun, Mussoorie, Agra, Jaipur, Udaipur, Jodhpur, Alwar, Chandigarh, Jammu, Kashmir, Haldwani, Ranikhet, Kasauli and Gwalior. If you are interested to visit any religious city like Haridwar, Rishikesh, Mathura, Vrindavan, Shirdi, Shani Shingnapur, Ajmer, Amritsar then we can do all the arrangements for you. We also provide Chardham Yatra, Amarnath Yatra, Tirupati Balaji tour, Vaishno Devi Yatra, Amritsar Temple trip from Delhi. If you are in Delhi for some reason and want to visit local places like India Gate, Lotus Temple, Akshardham Temple, Birla Temple, Dilli Haat, Humayun’s tomb, Iskcon Temple, Jama Masjid, Jantar Mantar, Parliament House, Purana Quila, Qutub Minar, Rashtrapati Bhavan, Red Fort, and Gurudwara Bangla Sahib then we also provide cars,taxi, minibuses and tempo traveller on rent in Delhi for local visit.